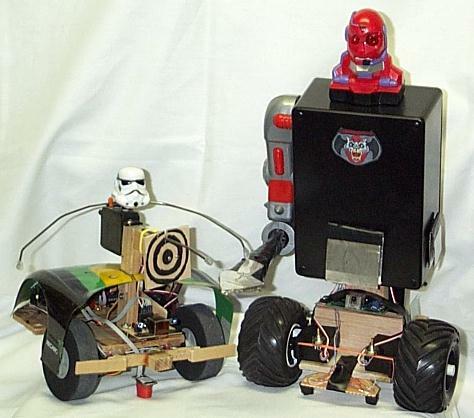 To view a short avi (240K) file of the First Practice TRCY Robot Fights click on the above text. Welcome Ladies and Gentlemen to the TRCY Robot Fights! The Fights are coming back soon! Your mission, should you decide to accept it is, is to design the best autonomous fighting robot you can and send it off for combat in the TRCY Fighting Robots contest. Your robot must be able to fight on it's own, under it's own power (NO R/C ALLOWED). Your robot must be built following the rules of the contest (see below). The most challenging and exciting part of this contest is that you must send (via mail) your robot to the TRCY fights. It's the ultimate fighting challenge, to design a build the best robot you can for combat in battlefield you can't control. No last minute modifications. It's a real world robotics challenge because your creation has to go out their in the world and survive. 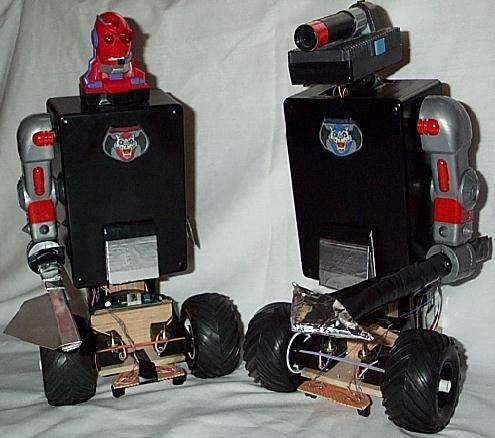 Still curious about the TRCY Robot Fights? Well then let me introduce myself, my name is Justin Ratliff and I'm the current president of TRCY. Because TRCY is an online based robotics club with members all across the globe and from every corner of the U.S. it is not convent for builders to meet regularly, so entering robots must be mailed to the fights. The fight take place at my home in the Cincinnati, Ohio area. This is a new type of contest, one that was uniquely created by TRCY member. As such the idea of building a robot that must be mailed somewhere to compete in a contest may sound flaky to some people. This is very understandable. One big question that would come to peoples minds for sure is, "how can I trust I'll get my robot back?" If you don't know me feel free to leave a posting asking members of the club I have worked with before about my character and ask Dennis Clark what he thinks of the contest. Dennis (who hails from Colorado) has entered his creation, which is appropriately named "Evil Empire." Evil Empire has whipped two of my robots in a number of matches so far. Another big question on your mind might be, "will my robot come to any harm during these fights?" The answer is no, unless you construct your robot poorly. This is a thinking robots war, not a bash-em-up contest like the remote controlled Robot War or BattleBots; this contest is totally different. The smarter your robot is the better it will fare in the contest. By smarter I mean the ability to read in more sensor information than the other robot. No damaging weapons are allowed and the most that could happen is your robot is knocked over. The contest has been designed to minimize any possible damage. However, I learned the hard way that if you don't properly secure wires on your robot that it is extremely possible any such lose wires may be pulled out, resulting in damage to your components. See the rules and design notes for further details on these subjects. "Who can enter the contest?" Only members of TRCY can enter the contest. "How do I get my robot to the fights?" You must mail your robot to the fights at your own expense. I will ship (via U.S. Priority Mail) your robot back to you at any time you request at my expense. In the future we hope to start a yearly meet for TRCY members where a fighting contest will be one of the events, but so far no plans for that have been studied in detail. Or course if you are in the Cincinnati Ohio area you are more than welcome to bring your robot to my home for the fights. "If my robot beats all the other robots, do I win something" I do plan on offering prizes if I can get 4 or more other robot entrees to the fights. "How do we get to see what happened in the fights?" I will video tape the robot fights and upload them to YouTube.com for anyone to access. Also for the next fights I plan to send a complete VHS video tape copy of the fights to those who enter. "Are you ready for team matches?" No, currently all robots will fight elimination matches with each other until one robot emerges as the winner. The idea has grow out of the mold I once conceived for simple nervous net creatures that haplessly fight one another attempting to tear and cut into one another with saw blades and stabbing weapons. My goal is more than that. My goal is to one day create robots that are capable of capturing, holding and defending territory. To do so I want to develop two classes of robots, Predators and Defenders. Each type working together in teams to capture and hold objectives, like a recharging station for the bots. This will be an on going project that will only halt when I make two teams of robots that can capture and hold my house and defend it from an opposing team. Just a note, in previous rules fighters needed to have two motor shut off contact areas. Rules now state that you only need one main contact area being 2x2-inches in size. All important info on my fighters will be on this site so everyone can see how my fighters are built. Future failure and success notes will also be posted here for anyone who wishes to track our progress. I will try to be as complete as possible in my notes to provide parts lists, schematics and source code. UPDATE: The robots fights will be starting again soon with new rules and new basic designs. I'm going to use my J2 Robots as the main platform for the different styles of robot combat games. PAST Fights: Fellow Member Dennis Clark sent me his Fighter Bot Evil Empire and he and Sir Dinadan all ready fought 3 test fights on October 6th. The first fight was just awful for my fighter. He was slow, ran out of the ring, and was an easy opponent for Evil Empire to beat. Dinadan's tactic was make a fast stab at his opponents when he saw the other robot in front of him. After that he randomly picked a direction to go and then looked for his opponent again. This did not work well for him at all! To view the fights click here. I hope to build up an archive of several programmed tactics for my fighters to be able to carry out. One down side to my fighters is that they use Basic Stamp 1's with limited code space, so I'll have to pick the best tactics for them to use against their opponents. I hope one day to make them capable of picking the correct tactic on their own. Sir Sagramore is currently being completely updated. Dinadan is dead for good this time, I think. These are some of the Polearms which my fighters could carry in their hands. Polearms are like lances and long spears. The word Polearms hear means a pole with a weapon on the end, not as in weapons made for the Polish army. They may look silly, but I have made a variety to try out in the coming fights. The two to the left are designed to tie around the fighters hand so he can't drop his weapon, the other weapons fit tight in the small hands of the fighters. I based my polearms on designs from medieval times. Some are designed with odd angles to hit the opponents shut off switches from the front and from the side, such as the second one from the right. 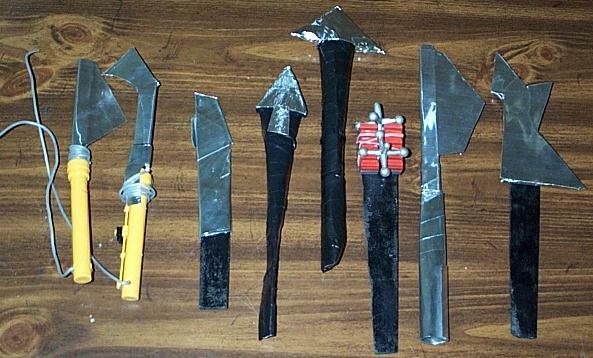 Some are designed in the hope they might tangle up the other opponents weapon such as the third one from the right. Here is one Arms and Armor website that I took ideas from. The Fights are coming soon! To the left is Evil Empire (Built by Dennis Clark) and to the right is Sir Dinadan. It was a good match up with these two going at each-other in the practice fights. This is exciting, I can't wait to see how we can improve these guys. Mine may be bigger, but Dennis's fighter bot is smarter and has a bigger brain! He is using a self-built Basic Stamp II and is using Subsumption architecture in his program. I, on the other hand, am using a Basic Stamp I, which has less then half the memory space for program code! Sir Sargramore after being upgraded with a new head and vision system which detected motion was tragically destroyed in a test fight against Evil Empire. A new Sagramore is already under construction. The Fighting Robot Club of Yahoo!